The woman who was arrested for OUI after she was involved in a motor vehicle crash with a school bus is scheduled to be arraigned Monday morning. Christy Gilpatrick, 27, of Warren, Rhode Island was arrested for the Saturday night incident after she allegedly drove while under the influence of alcohol. 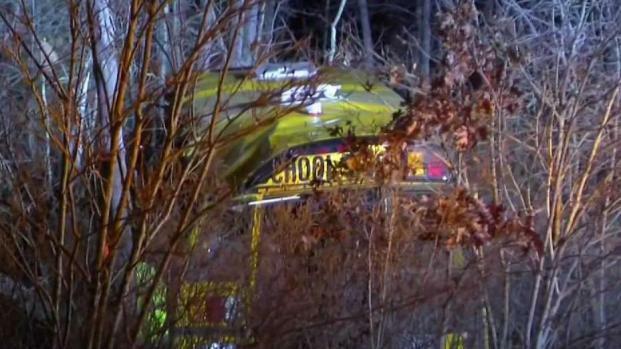 An investigation indicates Gilpatrick and the school bus were both traveling south on Route 24 in Berkley when for an unknown reason, both vehicles swerved off the road near exit 11 and into the woods. The school bus was carrying a total of 23 passengers that included the driver, adults and children. Several passengers suffered serious injuries while others sustained minor injuries. State police said the passengers ranged in age from infants to elders. Whether or not the driver is at fault for the crash remains under investigation. The passengers were First Student employees and their loved ones who went on a company trip to La Salette Shrine. "Sadness. Great, great sadness," Father Ted Brown of La Salette Shrine said. "I'm concerned for all the people who were injured, and I know it varies from minor injuries to some serious injuries." State police said this is the second time Gilpatrick has been charged with OUI. She was charged on Saturday with OUI alcohol second offense, negligent operation of a motor vehicle and marked lanes violation. Officials are continuing their investigation and are working to determine if Gilpatrick’s role in the incident caused the crash. Gilpatrick is scheduled to appear at Taunton District Court. It is unclear if she has an attorney.